Included in the original designs for Central Park was a children’s area where Victorian youngsters could play in the fresh, open air and enjoy amusements not available elsewhere in the city. Among those amusements was a carousel. 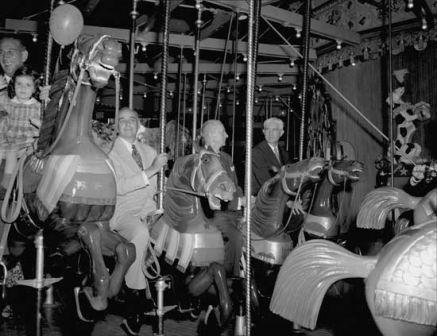 The "hobby horses and merry go rounds" (there was actually only one) McCabe described were gaily colored and fantastic – certain to captivate young imaginations. Opened in 1871, the great turntable ran on mule power. As children laughed in delight, riding their wooden painted steeds above, a mule in a pit below ground powered the mechanism along. The animals, plodding along on a treadmill, were trained to stop and go when the operator stomped his boot on the carousel floor. The public opinion won out and the carousel kept turning. "LOST – At merry-go-round or carrousel in Central Park, on Sunday, April 16, one rag doll; $5 reward for return to Netherland, 5th Av. And 59th." The hotel was besieged with people carrying dolls, claiming to have found them in the Park. “Five dollars reward tempted those who were foolish enough to imagine that a five-year old girl would not know her own precious Herbert from every other doll on earth,” said The New York Times. In the end a little impoverished waif returned Herbert, refusing the reward because she had stolen him. Another story from the carousel ended happily. In 1912 the days of underground mule power were, happily for the mules, a thing of the past when an electric motor was installed. Then in 1924 the carousel burned to the ground. 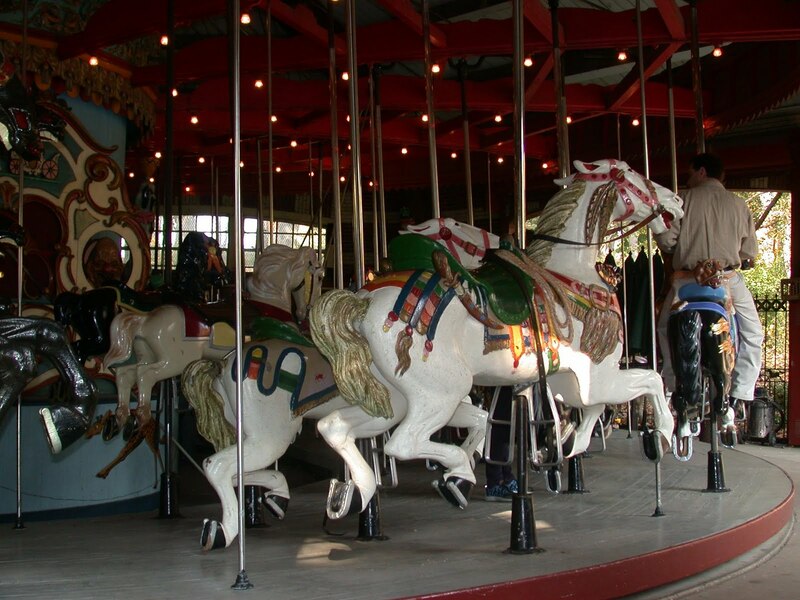 The new carousel spun merrily along until November of 1950 when this one, too, burned. 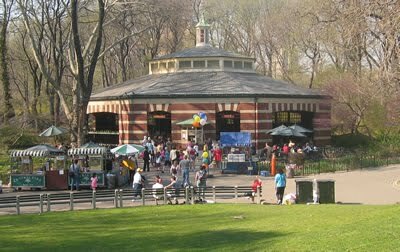 “The Central Park carrousel, dear to the hearts of small New Yorkers since 1871, was ruined by fire before dawn yesterday. Its forty-four gaudy wooden steeds were charred into black immobility, while fire and water combined to halt its mechanism and silence its carnival music,” reported The Times. A search for a suitable replacement was initiated. Amazingly, a wonderful, if derelict, carousel carved by the Brooklyn firm of Stein & Goldstein between 1908 and 1911 was found abandoned in an old trolley terminal at Coney Island. 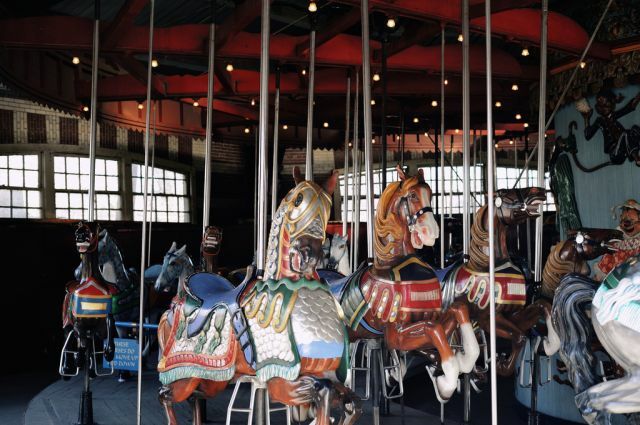 Utilizing a $75,000 gift from the Michael Friedsam Foundation that included a new building, the New York City Parks Department restored the ride at its Randall's Island facility; repainting the nearly life-sized horses and updating the equipment. On July 3, 1951 the carousel was operating with rides for free on that opening day. Mayor Impellitteri rode a chestnut charger along with other politicians and hordes of shouting children. With 58 hard-carved horses and two chariots, the carousel is one of the largest in the country and considered one of the finest examples of American turn-of-the century folk art in existence. The vintage Ruth & Sohn band organ was modified to play 150 Wurlitzer paper music rolls by Carousel Works of Mansfield, Ohio. In the 1990s the Central Park Conservancy funded new landscaping around the carousel and, once again, the restoration of the horses. More recently, the band organ was refurbished by Gavin McDonough. Throughout the years the carousel has attracted young and old, rich and not-so-rich (“Mrs. John F. Kennedy rode the horses on the Central Park carousel shortly before noon yesterday with her son, John Jr.” reported The Times in 1964). Today the ride costs $2.50, up from fifty cents in 1871, providing entertainment to nearly 250,000 riders every year. Rag dolls ride for free. Many thanks to Richard Concepcion, member of the National Carousel Association for his invaluable input on the above. Mr. Concepcion worked on the Central Park Carousel from 1973 to 1980.